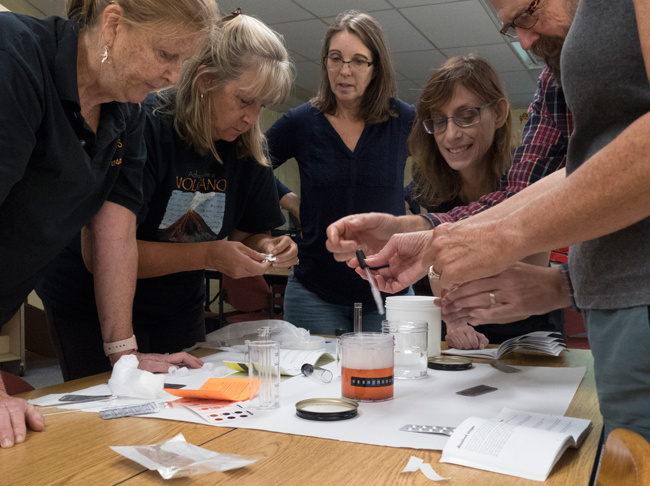 In Photos: New York Sea Grant and the Long Island Sound Study prepare teachers to "Be in the KNOW"
Participating teachers prepare water samples for testing. Credit: Ryan Strother/NYSG. Northport, NY, November 2, 2018 – As one of the key building blocks of life, nitrogen is essential for the growth of all plants and animals. But when humans add too much of it to waterways serious problems can arise. 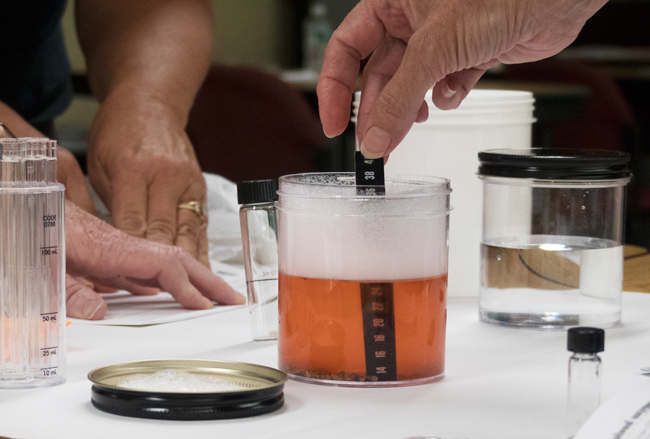 To help educate Long Islanders about the impact of nitrogen, New York Sea Grant (NYSG) and the Long Island Sound Study (LISS) presented a workshop this fall through the Long Island Sound Mentor Teacher program (LISMT). The LISMT program, now in its eighth year, provides teachers the opportunity to educate their peers and share successful classroom teaching strategies on issues that affect the health of Long Island Sound. A sample sheet, used for measuring pH, phosphate, and turbidity. Credit: Ryan Strother/NYSG. Coordinated by Anna Weshner-Dunning, LISS’s New York Outreach Coordinator, the “Be in the KNOW” (Keeping Nitrogen Out of our Waterways) workshop served as an introduction to nitrogen and water testing curriculum for some of Long Island and New York City’s science teachers. The workshop and presentations, conducted at Northport High School on September 22nd, were led by Torie Hehir, eighth grade Earth Science teacher for the Northport-East Northport school district, and Bob Mozer, seventh grade science teacher and science research club leader for the William Floyd School District. The pair introduced teachers to the basics of the nitrogen cycle and its significant impact on Long Island’s waterways. 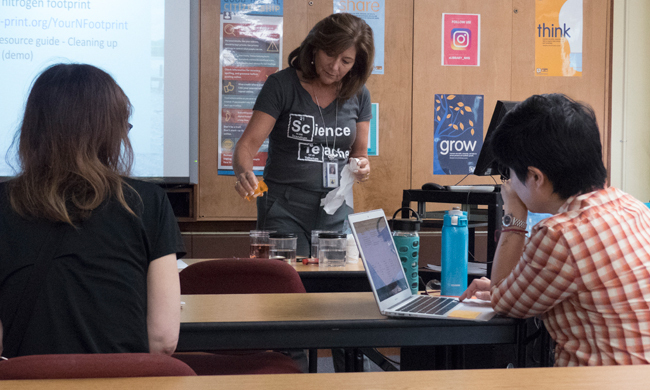 Torie Hehir introduced teachers to the problems associated with excess nitrogen and demonstrated a classroom activity designed to simulate nutrient pollution. Credit: Ryan Strother/NYSG. Hehir explained that pure nitrogen is relatively inert. Before nitrogen can serve its vital purpose for plants and animals, it must be fixed via the nitrogen cycle into reactive nitrogen. Nitrogen fixation occurs when microorganisms convert nitrogen gas into usable nitrates. This reactive nitrogen is primarily produced for the agricultural industry and used domestically as fertilizer. When excess reactive nitrogen runs off into waterways, it can cause algal blooms, fish and turtle kills, eutrophication (excess nutrients causing a dense growth of plant life and death of animal life from lack of oxygen) and have impacts for groundwater and threaten the drinking water supply. 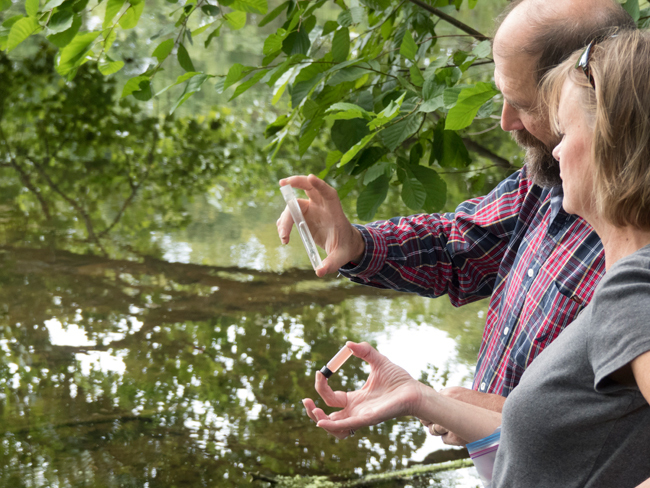 Teachers took temperature readings and measured nutrient levels from a “polluted” water sample. Credit: Ryan Strother/NYSG. Mozer explained that compared to nature, humans produce over two times the amount of reactive nitrogen. In addition to surface fertilizer runoff, Long Island’s groundwater also receives nitrogen through the leaching pools commonly utilized in domestic septic systems. So, as the population of Suffolk County has increased in the past century—and with it the number of septic systems—so have levels of nitrogen in the groundwater. Older septic systems, unlike new ones installed today, were unable to filter out and prevent nitrogen from leaching into the groundwater. 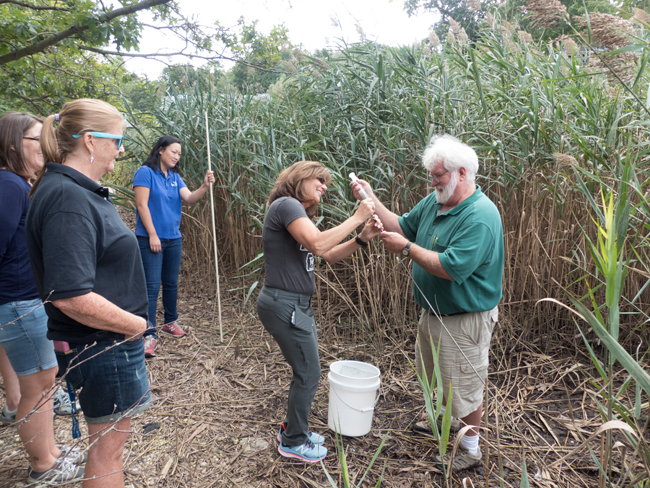 After the classroom work, educators took a trip to Twin Ponds and Phragmites Park to get hands-on experience testing in the field. 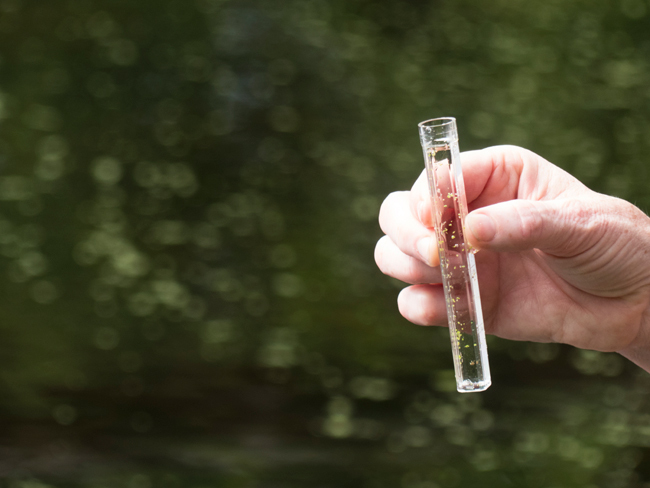 Teachers took surface and ground water samples to test for nitrogen and phosphorous. Teachers left the training prepared with information, curricula, and hands-on demonstrations, as well as a field guide and equipment to help students “Be In the KNOW” about nitrogen. 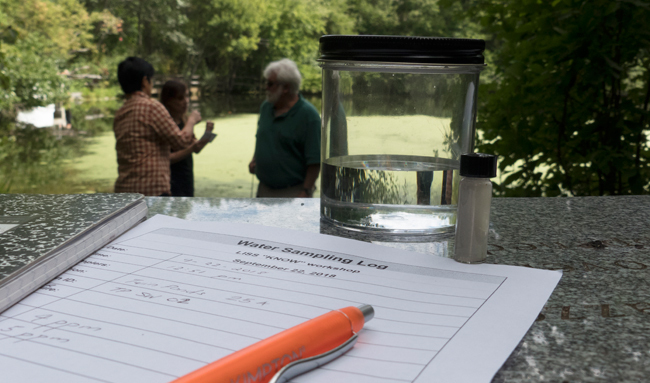 Having tested samples at Twin Ponds, teachers were then prepared to bring nitrogen education into their classrooms. Credit: Ryan Strother/NYSG. Large amounts of nitrogen loads in Long Island Sound and other water bodies can stimulate an excessive growth of plant plankton and macroalgae, a process that can lead to eutrophication. Credit: Ryan Strother/NYSG. Bob Mozer (right) and Torie Hehir (center) demonstrate groundwater testing equipment at Phragmites Park. Credit: Ryan Strother/NYSG. 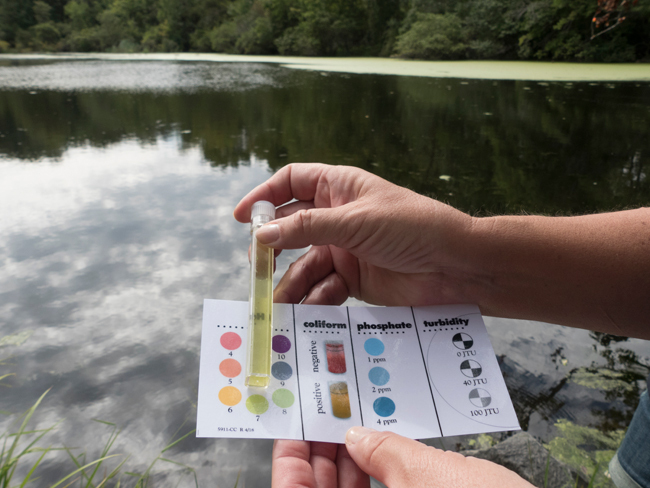 Phosphorus, a nutrient responsible for plant and algae growth, was once a common ingredient in dish soaps and detergents and can still be found in some household products, as simulated in this water sample. Credit: Ryan Strother/NYSG.